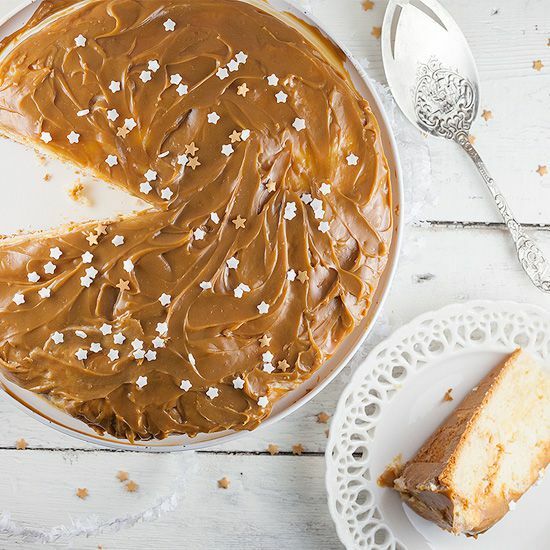 A super delicious dulce de leche and vanilla cake is even better than a cake with caramel. Use some sugar stars to create some Christmas feelings. PRE-HEAT the oven to 175 degrees celsius or 350 degrees fahrenheit and line the spring form with parchment paper. ADD the butter to the electric mixer and mix until it’s fluffy. Gradually ADD the sugar, a tablespoon of vanilla and the milk. Slowly add the baking powder, flour and salt and MIX well. DEGREASE a bowl and whisk with a few drops of lemon juice and BEAT the egg whites until they’re fluffy. 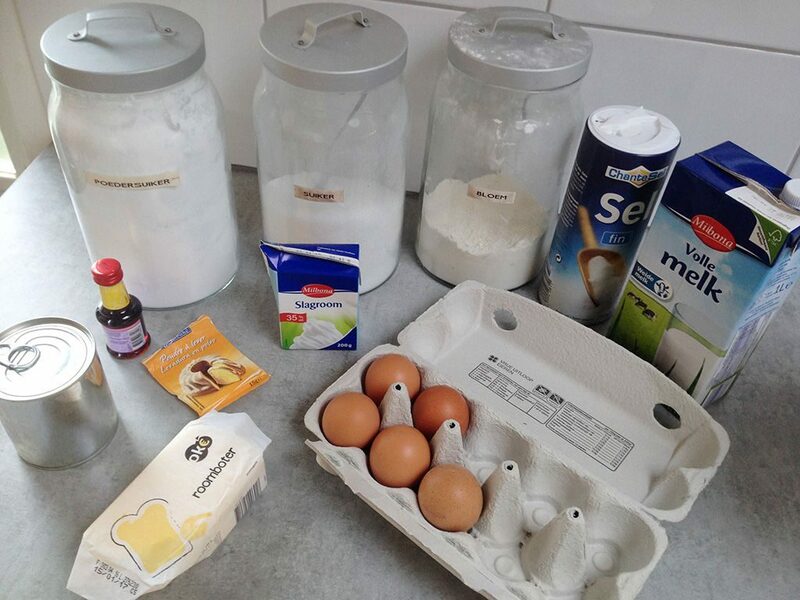 Carefully ADD the egg whites into the mixture and combine until you’ve reached a smooth cake batter. DIVIDE the batter of the spring form and BAKE in the oven for about 45 minutes. CHECK with a wooden skewer, if it comes out clean the cake is done. TRANSFER to a cooling rack and let the cake cool off completely. ADD the butter for the frosting to the electric mixer and mix until its fluffy and then gradually ADD the powdered sugar. When it’s combined well, also add the vanilla, a pinch of salt and the cream. DIVIDE the cake into halves and divide the frosting over the bottom half. 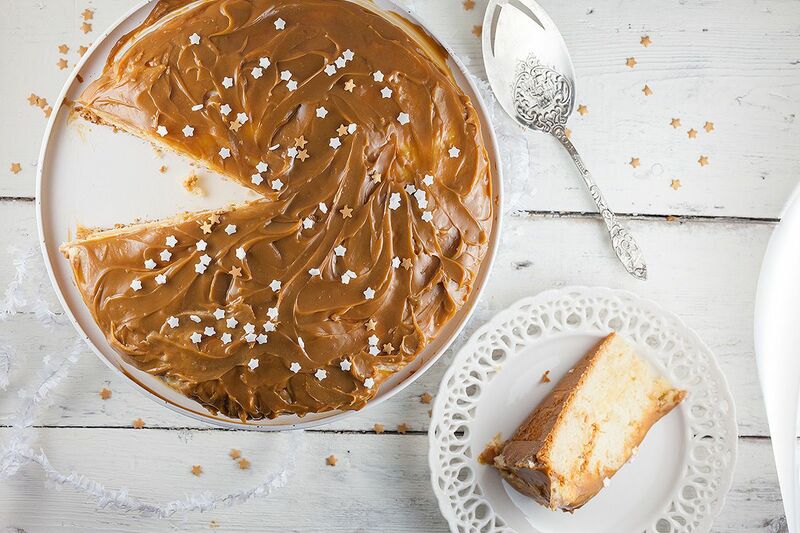 PLACE the other half of the cake on top and coat the sides and top with dulce de leche. If you like, you can ADD some sugar stars on top, enjoy!